Most people suffer from low back pain (LBP) at some point in their lives, so it’s not surprising that we’re often presented with this issue at the clinic. Osteopaths are well equipped to deal with many forms of LBP. Most cases only require a few treatments, however some chronic cases can be more challenging. There are a number of possible causes and it’s our jobs as osteopaths to diagnose where the pain is arising from and ensure it doesn’t return. Our examination will investigate your case history, your body’s range of motion, muscle tone and flexibility. Sometimes we may need to organise additional examinations such as an x-ray to confirm a diagnosis. In some chronic cases of LBP the underlying cause may be a debilitating condition such as rheumatoid arthritis or anklyosing spondylitis, which will be uncovered by our examination as well as x-rays and blood tests, or which you may already have been diagnosed with. Unfortunately some chronic conditions such as these may never be completely resolved. However, a maintenance plan can be designed to help you manage your back condition with osteopathic treatment, supplements, exercises and postural advice. We have found that in our patients that the right management and treatment plan tailored to the specific circumstances can make the world of difference to daily life. Commonly, patients come to the clinic after a lifting injury or where they have bent down to pick something up and felt their back "go". Sometimes it can occur during a relatively minor activity such as gardening, making a bed or even sneezing. This type of injury usually results in localised pain in the lower back where it is painful to bend, or sometimes to sit or roll over in bed. Sometimes the injury can be more severe and result in pain down the legs described as sciatic pain or lumbar nerve root irritation. 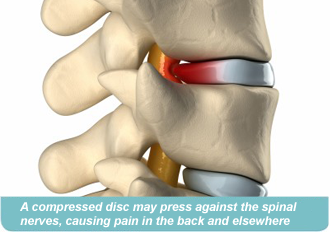 The underlying problem is that the discs in between our vertebra, which usually act as shock absorbers, have been compromised and are pressing against the nerves in the back. Having it treated immediately is recommended. Another common problem is a generalised stiffness that usually occurs gradually and is often worse when sitting or first thing in the morning. Whatever the presentation of your pain, we are equipped to help you recover. As osteopaths we can determine which joint, ligament, muscle, tendon, disc or nerve is "out", strained or aggravated and treat the injury. In more chronic conditions such as osteoarthritis, rheumatoid arthritis, ankylosing spondylitis, spondylolisthesis and scoliosis a more detailed treatment plan needs to be formulated and the combined efforts of osteopathic treatments and other modalities should be used. Whatever the reason for the low back pain we can help you get back on your feet faster and ensure it does not come back.